This morning, January 13, 2014, my dog, Casper, was looking out the balcony doors and started barking. I thought at first he was just barking at the squirrels that are always around but his started growling too. I decided to take a look and sure enough a had a fat Possum that was half out from underneath my barbecue cover. Maybe with all the cold weather it has decided to take shelter. Now I do not want to let my dog outside in case he has a run in with our unwanted guest. It was brave enough to even come up to the balcony door while my dog kept barking and wanting to get at it. 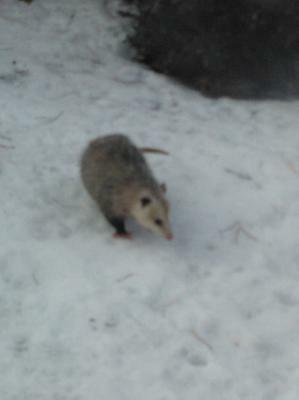 The Possum was likely quite hungry after this hard winter - they don't attack or harm pets, he's just looking for food.